Hey folks! Long time no read. Looks like it’s pretty dusty around here. The blog hasn’t been updated since August. Yikes! I guess you can say I’ve been busy. Over the past 3 months I’ve moved back from San Francisco to Boston, started working for my old company in Cambridge again, ditched my red hair for blonde, and Hurricane Sandy flooded my kitchen and dining room. So yes, it’s been an eventful third quarter. In an effort to see if I can get back into the blogging swing of things I’m going to give the November NaBloPoMo thing a go. If you aren’t familiar with this particular acronym it stands for National Blog Posting Month. That’s right. The person who hasn’t managed to write a single thing in dozens of weeks is now going to attempt to create new content (of some sort) every single day during the month of November. We’ll see how that goes…if you start finding a lot of pictures of Watson and Dexter posed with various kitchen implements in your RSS reader then you’ll know I’m struggling. Anyway, wish me luck! Also, please let me know if you’ll be participating too. I’d love to follow along with your own NaBloPoMo efforts. Currently I know that Nicole from Pinch My Salt, Alejandra from Always Order Dessert, and Rebecca of Grongar Blog are all participating, and a little bird told me that Pam from Cave Cibum might also take the plunge. If you’d like more info about NaBloPoMo I’d recommend checking out BlogHer’s details and also signing up for Shareaholic’s newsletter. They’ll both be offering prizes and great tips for getting us through this daily posting marathon. Hm. I was realizing just this morning that NaBloPoMo starts tomorrow and when my dad called to check on my during Sandy he asked if I had abandoned my blog. Maybe it’s time to get back into the swing of things? Count me in for the attempt, anyway. Erin, you have totally inspired me! I haven’t blogged since last December and I keep saying I’m going to start again soon. This is perfect! Thanks – and welcome back to the east coast. Great news! I think a lot of us have been very tuned out from blogging. I really don’t know how so many folks are able to keep up the level of posting and creative photos that they manage to produce weekly. It’s crazy. I was very burnt out. I’m hoping this boosts my creativity and doesn’t totally kill it forever. Oh, I’m so glad you’re attempting it, too! This will be fun!! I’m still learning how to use the Blogsy app on my iPad and was feeling a little typing-challenged. Anyway I gave you full credit and invited folks to hop over here for some great ideas. Isn’t it funny how so many of us have sort of let our blogs go? Good luck to you and everyone else as we take on this challenge! Oh, I am definitely in! 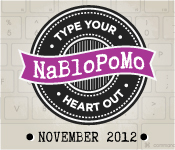 Found you on Twitter – good luck with #nablopomo this month!